Men have gotten all new jobs in retail over the last 2.5 years. The economy added just 80,000 jobs in June, bringing the average over the last four months to 92,000. This compares to a monthly rate of 252,000 for the four months from November to February. Part of the weakness in the June job growth is likely still attributable to better-than-trend job growth in the winter. This pulled hiring forward so that normal seasonal hiring did not take place. This pattern can be seen very clearly in several important sectors. Restaurant employment grew at an average rate of 29,000 in the winter months; it has grown by just 13,000 a month over the last four months. Retail employment grew by 22,000 a month in October through January. Since January, employment has fallen by a bit more than 1,000 jobs a month. Construction employment grew by an average of 14,000* a month from November to February. In the last four months it has fallen at an average rate of 14,000 a month. This drop is difficult to reconcile with Census data that show construction spending up 1.1 percent from February to May. While the overall picture in the establishment data was weak, there were some positive signs. The local government sector added 4,000 jobs in June indicating that employment may be leveling off. Manufacturing added 11,000 jobs, maintaining its modest rate of growth. The health sector added just 13,000 jobs, about half the normal pace. This is likely an anomaly, but if not, it would imply a slower rate of growth of health costs. It continues to be striking that a disproportionate share of the jobs being created are going to men. This is not due to the comeback of manufacturing and construction. Since December of 2009, manufacturing has added just 496,000 and construction has lost 145,000 jobs. The real story is that men have gotten a hugely disproportionate share of the jobs in industries with more of a gender balance. For example, in retail since December of 2009, men have gotten 474,000 jobs while women have lost 49,000. Men have gotten 190,000 of the 192,000 jobs created in transportation. In finance they have seen an increase in employment of 123,000 while the number of jobs for women fell by 65,000. It is too early to know if this trend will continue, but the disproportionate growth of jobs for men in these and other areas over the last two and a half years is striking. The household data is consistent with the weak picture of the labor market shown in the establishment data. With the overall unemployment rate remaining steady, there were few major changes by demographic group. There was a 1.3 percentage-point jump in the unemployment rate for black women, but most of this was due to more people entering the labor market. The employment-to-population ratio (EPOP) edged down by just 0.1 percentage points. Older workers continue to get a disproportionate share of the jobs, with employment of workers over age 55 rising by 169,000 in June, more than the overall increase in employment in the household survey of 128,000. Over the last year, older workers have accounted for 57.9 percent of employment growth. One striking development is a reported drop in the unemployment rate among workers in the construction industry from 15.6 percent in May to 12.8 percent in June. With construction workers accounting for less than 4 percent of the total workforce, this means that unemployment in the sector is raising the overall unemployment rate by less than 0.2 percentage points. In other words, there is little truth to story of the downturn as being displaced construction workers being unable to find new jobs. Overall, this cannot be seen as a good report. 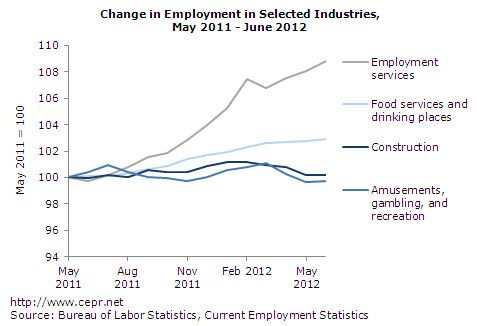 Still, if construction employment had grown in line with spending, health care had been in line with its usual pattern, and there had not been anomalous drops in jobs in educational services (9,600) and transit and ground transportation (7,400), the jobs number would have been close to 150,000. It is still likely that the second half of the year will see job growth in this neighborhood. *Corrected. This article originally stated that "Construction employment grew by an average of 48,000 a month from November to February."